Church Visitor Horror Stories: What’s Your Worst? We’re launching a new contest in celebration of our upcoming book, Unwelcome: 50 Ways Churches Drive-Away First-Time Visitors by Jonathan Malm. Ready to get scary? Walking into any new place can be a bit unsettling. But walking into some churches for the first time can be downright frightening. We want to hear your church visitor horror stories. The service starts and you wonder if this church has developed their own language because you don’t understand half of what’s being said. But looking around you’re the only one who appears to be confused. You make it through the service and the pastor asks you to fill out a card with your name, address, phone number, birth date, children’s names… you’re wondering if you’re visiting a church or applying for a job. But, bonus, if you turn that card in at the super duper guest center, you can get a free gift! Churches have the best of intentions. But too often those intentions don’t translate and we’re anything but welcoming. We’re scary. As we gear up for the launch of Unwelcome: 50 Ways Churches Drive Away First-Time Visitors on Oct. 27 (pre-order digital now), we want to hear your first-time visitor horror stories. Yes, they will most likely make us chuckle… and maybe even cringe… but we want to share these experiences in hopes that we can avoid repeating them in our own churches. The contest is now closed. Thanks for playing (er, scaring). Check out the frightening winners: Fired pastor, reserved seating and stalking the visitor. Learn more about how to welcome church visitors with this collection of resources and blog posts. 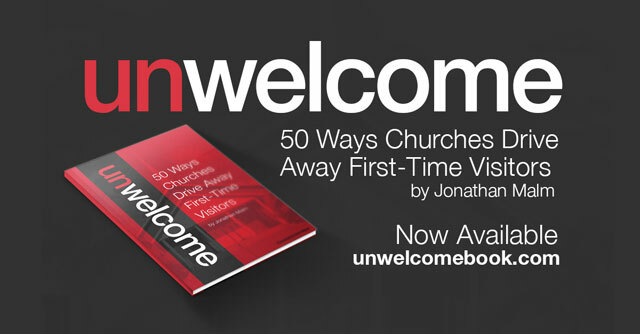 Check out Unwelcome: 50 Ways Churches Drive Away First-Time Visitors by Jonathan Malm. Katie Strandlund is a champion of dreamers, friend to artists, and encourager of creatives at heart. She is passionate about the intersection of big idea vision and practical strategy. Read more posts by Katie Strandlund | Want to write for us?